Please take a few minutes to respond to our listener survey. 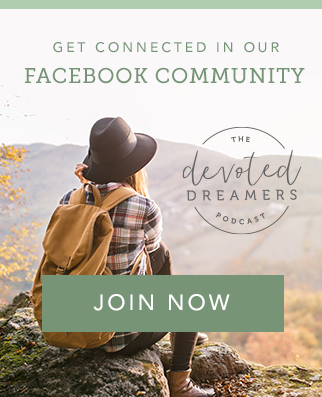 Respond by the April 15th deadline, and you’ll be entered to win your choice of a $10 Amazon gift card or a signature Devoted Dreamers coffee/tea mug! Entrepreneur Amber Brannon returns to the podcast and shares how her faith has grown since our last conversation in 2017, and how God has transformed her dependence on Him personally and in business. In this episode, you’ll learn the importance of being clear about who you are (and who you aren’t) as you pursue your dream. Amber describes what that process was like for her company, Copperheart Creative, and how it helped them discover the types of clients they love to serve. Amber teaches us what she learned from trying to control everything – including that it’s not possible – and how she’s letting Jesus take control, instead. Plus, there’s a tried and true sign that you’re not trusting God; she knows because it happened to her. Amber reminds us what it’s like when you try to go it alone; you’ll be inspired to follow in her footsteps to find women who can walk with you on the journey of pursuing your dream. IF YOU HAVE EVER WONDERED HOW TO INTERSECT YOUR FAITH WITH YOUR WORK, THIS WAS THE EPISODE FOR YOU. Amber is a lover of people and Jesus, and a self-confessed coffee-choc-oholic who wants to unleash stunning design on the world. After much wrestling with God she quit her steady full-time job with no backup plan and started doing freelance design work. Today, she is listed among the Top 10 Designers in Tennessee, but experience has taught her that she can’t do it all alone. The best lesson she has learned since starting her business is to join other talented people who complement her skills. That’s how Copperheart Creative was born! Together, they are a team of creative entrepreneurs focused on branding, each specialized in their own craft, and serving businesses with heart. If you enjoy just one episode a month, why not join my support team with a $5 monthly contribution and get a dose of extra content specifically for patrons of the show. Just click the Patreon button. Subscribe and leave a review on Apple Podcasts or Stitcher Radio.